400 & 410 N. Michigan Ave. The land for the building, chosen by William Wrigley Jr., is unique because of its triangular shape. Mr. Wrigley's goal was to create an impressive headquarters for his successful chewing gum company and the northwest corner of Michigan Ave. was the perfect location. During January 1920, when excavation for the building began, the Michigan Ave. Bridge was under construction, and the portion of the Ave. north of the river was then known as Pine St.. 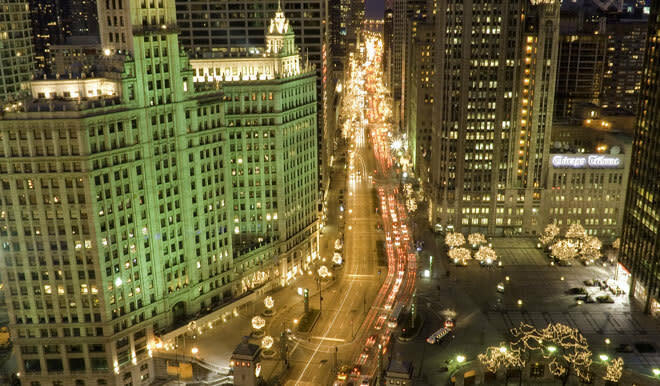 The Wrigley Building became the pioneer structure in the development of the north Michigan Ave. business district. The architectural shape of The Wrigley Building is patterned after the Seville Cathedral's Giralda Tower in Spain. However, the ornamental design of the building is based on an American adaptation of French Renaissance style. Mr. Charles Beersman, chief designer for the building's architects, Graham, Anderson, Probst and White, used his talent and imagination to combine the two concepts. On November 11, 1920, the building's cornerstone was laid for the southern tower. Office space in this part of the building was already entirely rented when construction was completed in April of the following year. In May of 1924, the north tower was completed and connected to the south section with walkways at street level and between the third floors. Later, in 1931, a 14th floor walkway was put in place.